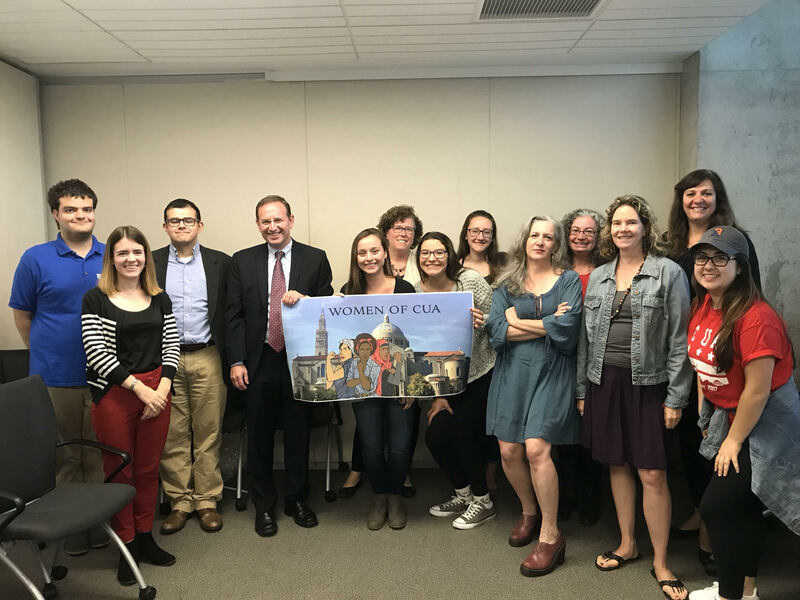 The Women of CUA student organization hosted an open conversation following a wave of sexual harassment and assault allegations in politics and entertainment. The event aimed to discuss and share ideas and experiences regarding the current issues and how these cases pertain to our campus, in regards to Catholic Social Teaching and the human dignity of the female person. The conversation was open to men and women and was attended by both genders from different generations and cultural backgrounds. Eleanor Holdridge, Head of the Masters of Fine Arts Directing program, and Eileen A. Dombo, Assistant Dean and Chair of the Undergraduate Social Work Program, framed the conversation around the definition of sexual harassment as any unwelcome sexual advances or comments. These comments and actions interfere with a person’s ability to thrive. Professor Holdridge related this matter to her background in drama where one’s willingness to perform sexual favors could result in an actor landing a part in a production or being fired, as seen in the Weinstein cases. After framing the subject, Holdridge and Dombo opened the floor for discussion. Students initially hesitated to speak up but once conversation started, the rest of the crowd began to join in. The group discussion began with the idea that the #MeToo Campaign stops the silence and “opens the lid” up to talk about sexual harassment instead of sweeping the issue under the rug as usual. As Instagram, Twitter, and Facebook feeds flood with posts displaying the hashtag, the movement also raises awareness of how prominent the problem is, as well as creating strength in numbers by showing victims that they are not alone. One student mentioned that there are often feelings of shame linked to not speaking up right away after the harassment or abuse occurs, and this campaign is giving women the second chance to share their stories and have their voices heard. CUA’s Title IX coordinator, Frank Vinik, explained the process through which one could report an incident on campus and where to seek help. “Every college wants to believe that they are below the average but what we have come to find is that CUA is typical,” Vinik stated. Between August 2014 and August 2016 there were 40 reports of sexual violence or harassment against students, according to the statistics shown on CUA’s Title IX Report that was based on a campus-wide survey. These statistics prove to be in congruence with the national average, showing that sexual harassment is still very prominent on campus. The conversation then opened up to discuss strategies to combat harassment and what people can do to change the culture within the university and, hopefully, the world. In general, the consensus was that there needs to be a change in the way that the community views sexual harassment. There were expressions of sadness, discouragement, anger, and frustration within the group which facilitated a fruitful conversation. In light of the rapidly developing stories of the allegations against Harvey Weinstein and Kevin Spacey, along with the #MeToo social media campaign, conversations concerning the epidemic of sexual harassment and sexism, especially in the workplace, have swept the nation. This issue is taking over college campuses because the recent events relate to the daily lives of students. Along with this notion, other women distinguished the difference between the way that men and women have to live their lives. Some women discussed that there needs to be a change in the idea that “boys will be boys” and that being objectified is “just a part of being a woman.” The general agreement was that the example on the track team represents the culture at CUA. A freshman member of Women of CUA noted that there needs to be more of an emphasis from educators on sexual harassment on campus in order for victims to know their resources and better understand the parameters of harassment. It was noted that the faculty and staff all go through in-person training about Title IX, but students merely do an online course and watch a skit during freshman orientation. This led to a discussion about sexism in the workplace and how bystander intervention is a great strategy to begin empowering and encouraging people to use their voice in order to stop the discrimination and violence. The group agreed that catcalling and harassment is about power and dominance over another human being and that change will begin when the problem is called out on the spot. She expressed her desire to continue the discussion of the matter in order to leave a positive impact on the culture of CUA, regarding the attitude towards sexual harassment on campus. EMILY YOU ARE AN AMAZING WRITER AND PERSON.